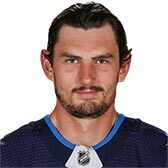 Connor Hellebuyck is 6' 4 and weighs 185 pounds. He is currently 25.9 years old. Will not play against the Nashville Predators tonight. Will not dress for tonight's game.